Garrett Leight Van Buren Combo - Matte Black Need Help? The Van Buren Combo is one of the best executed and most luxuriously detailed folding frames we have ever come across. In person everything about it feels substantial and rich. Garrett Leight's Van Buren Combo is an update to the iconic folding frame the Van Buren, with complimentary metal and acetate pairings. It features a color filled top bar and temples, acetate temple inserts, and semi-flat glass lenses. 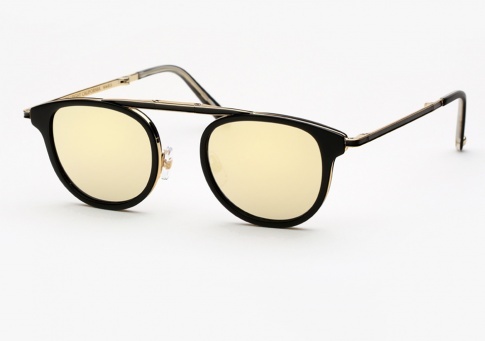 It is offered here in matte black acetate paired with gold metal, with semi-flat gold mirror glass lenses.